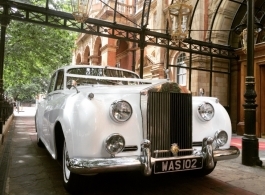 The Rolls Royce Silver Cloud is one of the most iconic and sought after classic wedding cars for hire in London. This 1961 series 2 model is absolutely perfect for weddings with its beautiful White bodywork and luxurious Cream leather interior. Rolls Royce Silver Clouds are renowned for being smooth running cars and for their spacious and comfortable interiors, this car will look fantastic as it arrives at and drives you away from your wedding venue.